Walking is one of the most undervalued workouts out there. Many runners don’t realize how much walking can help build their endurance and cardio. Walking 3 miles is the same distance as running 3 miles! Not only is walking an excellent bridge for someone just beginning to get started in running, but it also has its benefits for running too. So what makes walking great? Any runner can tell you how many times they’ve heard how “running is bad for the knees” or “hard on your body”. Walking is a great active recovery method. Walking three miles is not a “rest day,” but it is an active recovery day. If you feel sore after a long or hard run, going for a walk can help promote blood flow to your legs. After the New York City Marathon, I walked about 2 miles in the finishers shoot (I didn’t particularly want too, but you have too in that race). I believe that slow walk helped loosen up muscles and promote blood flow. It was the fastest marathon I’ve recovered from. Running can be boring and lonely. By walking, you might be able to walk a different route or path. You also might be able to walk with someone you never run with or even a pet. Now I like to walk in different local parks or even go on short hikes as cross training. Many runners, myself included, use walking or even hiking as a way to stay mentally fresh. There are many places easier to walk than run, such as a park, oceanfront, or even a crowded city. I’ve taken active recovery days and explored parts of Philadelphia or small towns in NJ. Hit the park, the ocean or head to one of your favorite places. Did you know many ultra runners use a walk running method? It is next to impossible to run for 100 miles straight, and many ultra-marathoners choose to walk/run. It’s also useful for someone looking to boost endurance by spending more time on your feet. I’ve hiked for 5 hours before, but I’ve never run more than about three and a half. (And no, that 5-hour hike was a hard workout, not a recovery day). If you are starting from scratch and never run before, it’s much easier to walk 30 minutes then run 30 minutes. Slowly, you can turn the walking into running. As you trade minutes of walking for running, the next thing you know you’re running for 30 minutes and not thinking about it. 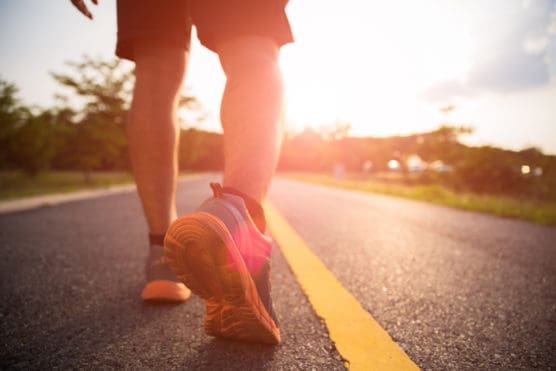 Walking is one of the best ways to come back from an injury. As someone who has had a few stress fractures, my doctors always advocated walking before running. After my bone healed, I would begin a plan that started with the majority of walking with short-run breaks. Then as weeks went by, the walking would transition to running. Finally, after a few months, I would be fully running, and my endurance would be stronger than I anticipated. Walking is truly one of the most undervalued exercises out there. From an easy 5 minute walk to a rigorous hike, it can be a great cross training tool for anyone. Next post: How Sick Is Too Sick to Run or Work Out?